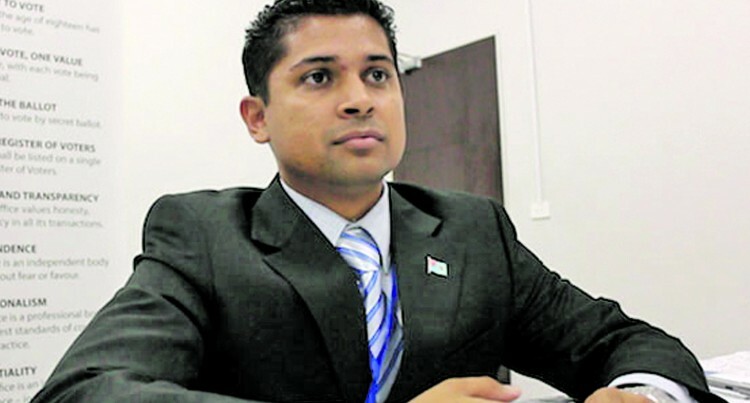 The Supervisor for Elections, Mohammed Saneem, has labelled a press conference called by SODELPA candidate, Lynda Tabuya, yesterday as “purely political.” Mr Saneem was responding to Ms Tabuya’s calls for him to be investigated, claiming that he had breached the code of confidentiality by releasing a copy of PDP’s management board meeting to the Fiji Sun. Ms Tabuya, as former PDP leader, called the press conference yesterday in response to the Fiji Sun report where the Fijian Elections Office, while announcing that the suspension of PDP had been lifted, revealed that trade unionist Felix Anthony, who is the former PDP leader, had attended a party management board meeting where the memorandum of understanding with SODELPA was decided. Ms Tabuya revealed that Mr Anthony was no longer a party member but attended the meeting as a consultant and adviser. Ms Tabuya claimed that Mr Saneem had abused his office and should be charged for abusing his constitutional office by revealing minutes of the PDP meeting that were submitted to him in good faith as a requirement for an on-going investigation. She said Mr Saneem was “duty bound not to reveal it” and called on PDP “to file a complaint to the Fiji Independent Commission Against Corruption… for this serious breach of confidentiality”. However, Mr Saneem said he had the powers to make his findings public when exercising public function, adding that Ms Tabuya had revealed more about the meeting and Mr Anthony’s role than was found by him. He said the Elections Office operated within the laws that created it at all times and ensured that public law action it undertook had proper legal and factual basis.